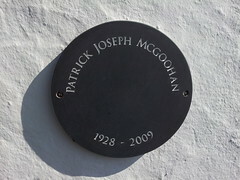 Patrick Joseph McGoohan (19 March 1928 – 13 January 2009) was an American-born Irish actor, writer and director who was brought up in Ireland and Britain, where he established an extensive stage and film career. His highest-profile roles were in the 1960s television series Danger Man (US: Secret Agent), and The Prisoner, which he co-created. Later in his career, he moved back to the United States and subsequently appeared as murderers in four Columbo episodes, winning two Emmy Awards, the only guest star so honored. In cinema, he had prominent roles in The Three Lives of Thomasina (1963), Ice Station Zebra (1968), Mary, Queen of Scots (1971), Silver Streak (1976), Escape From Alcatraz (1979), Scanners (1981), A Time to Kill (1996), Treasure Planet (2002) and memorably portrayed King Edward "The Longshanks" in Mel Gibson's Braveheart (1995). The Prisoner classic TV series stars Patrick McGoohan as a man who resigns from his top secret job and is held captive in 'The Village', where he is known only as 'No. 6', exterior scenes were filmed in Portmeirion and the 17 episodes retain cult status.